The Definitive Word on 3D from OK? In essence, Jackson & Jumper took the crude photo of the Shroud, determined location of 13 characteristic points on the face, determined their vertical coordinates on the model, determined the relative intensity of those points with VP-8 (much more primitive than ImageJ we use today), plotted linear regression, obtaining as a parameter max range of 3.7 cm, calculated correlation coefficient, determining that almost certainly there is at least some correlation, and then compared it with the profile for the whole front image of the Shroud. Simple technique, but remarkable achievement. That paragraph above is from the 29th slide in a self-paced, fully explained, fully comprehendible four-part presentation, 3D properties of the Shroud revised by regular participant O.K. Take the time to read this presentation carefully. Is this the definitive final word on the 3D properties of the shroud? No. For one thing it is unfinished, as O.K. tells us. O.K. promises to respond to our comments and questions and add to the presentation. So look for more. In my mind, this a very important presentation on the 3D properties of the shroud, perhaps the most important one so far. Am I convinced? Yes and no. I am convinced that the 3D means data is there. Smooth the image data, but not too little or too much, and you have, in essence, a height-field (my terminology, not O.K.’s). Sure, it easy to imagine that this means that the data somehow represents body to cloth distance. A carefully calculated correlation doesn’t make it so, however. It could be that there are other possible reasons even though I don’t have any strong ideas about what they might be. As you can see, the image is blurred too much -too high smoothing applied, and a lot information is gone. We have a handy image in original colors, but actually disastrous 2D resolution. The questions Hugh Farey raised yesterday about Ray Downing’s 3D work in a comment to The VP8 Cinderella Question reminded me of a previous posting of mine about Petrus Soon’s 3D work. I decided to reprint it below. But first read The VP8 Cinderella Question and the comment Hugh made September 26, 2015 at 1:00 pm. You might also find It is really, really time to rethink what we think about 3D useful before reading the following reposting from 2012. I certainly have real reservations about Petrus Soons’ 3D work. Any comments now? 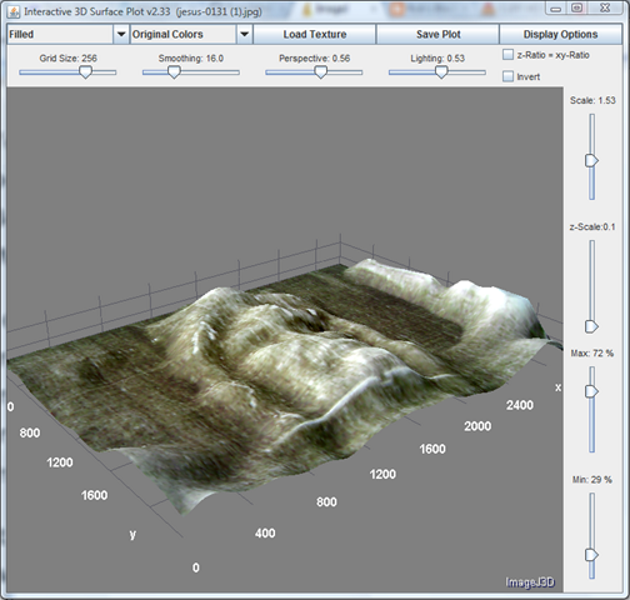 This website summarizes work connected with digitizing Shroud photographs taken by Giuseppe Enrie in 1931, enhancing the digitized images to improve details, translating the enhanced images “gray scale data into depth data”, generating a sequence of up to 625 images of each of these, and combining these images with a Holoprinter to produce holograms (3D images) of the Shroud. It also summarizes my study of these holograms and discovery of heretofore unseen details, which confirm many previous findings and reveal some suprises. Several comments followed; “Gave me chills! I believe!”, gives you the idea. There is nothing new here. But it is a subject well worth revisiting. Here is what I posted just over two years ago. Not one person commented at the time. Maybe I was just too wordy. Maybe I just said what nobody wanted to hear. Maybe . . . maybe. Any comments now? It is, of course, pointless to save this image unless you have red/cyan 3D glasses. The shroud3d website does have stereoscopic images for those who have the proper viewing equipment. It also has a short video showing slow and slight rotation of the image. 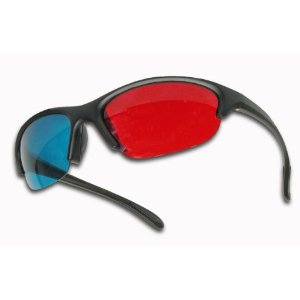 But these are poor substitutions for looking at an anaglyph with 3D glasses. The anaglyph is fantastic. It will knock your socks off. I took the bigger image and inserted it into a PowerPoint presentation. It looks great on an eight foot screen. Now all I have to do is buy 3D glasses for an upcoming talk at my church. I found some paper ones for $25.00 per hundred. I also had a poster of the anaglyph jpeg printed at Staples. It works great, too. I think this new 3D image is the most convincing scientific evidence yet for arguing that the shroud is authentic. No! The anaglyph may not be very scientific, at all. And that is a major concern because the impression one gets from the website and probably most places this image is displayed is that it is scientific. It may be, but if so, how so. 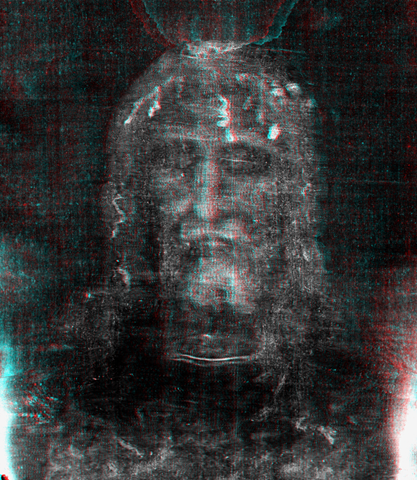 I am not at all convinced that the data found in the Shroud’s image supports the anaglyph on the website. I’m not convinced that adjustments that were made to the images (there seem to be many) are scientifically warranted. If this is so, if I am right, then the final product, the anaglyph at shroud3d.com must be thought of only as a work of art. Nothing more! Red and cyan 3D glasses that I ordered from Amazon.com ($4.70) arrived earlier in the week. I have since examined the anaglyph for hours. I was glad to learn from the pastor — one of this blog’s readers — that the full size image was available and I have studied it on a high definition 55 inch monitor. My first reaction was not unlike our friend above. Really, do order some 3D glasses at Amazon and prepare to be amazed. My second reaction was that there was something wrong. I thought at first, that in this more scientific conversion, the hidden information in the Shroud (3D information in the gray-scale), would be a nuisance or obstacle to produce a human representation of the face, and that I would have to struggle continuously against this. Strangely enough, this hidden scientific information in the Shroud became the key and the basis for this work, reducing my artistic work to only softening the “holes” and deformities (caused surely by the passing of time) and the adapting to what this scientific version commands you to do: filling in and normalizing the “holes” or “dead areas” in the hidden information of the linen. For example: the areas without information in the forehead have been corrected following the surrounding gray-scale with coherent information and with a normal human forehead in mind. This process was helped by the fact, that the central zone of the forehead and the bony structure of the orbits contain very coherent information and that of course was taken as a guideline. That statement lacks needed clarity. There are certainly holes and deformities. Why is not clear in most cases. It seems completely unjustified to speculate that these are caused by the passing of time. Without knowing how the image was formed, without knowing much about how the shroud was stored or displayed over many centuries, we shouldn’t make such guesses. Exactly what are the holes and deformities? They have not been detailed on the website. The bloodstains certainly are a problem and to make adjustments for these is perhaps warranted. But what about other deformities? How is the problem of banding addressed? Banding, a variegated background pattern to the cloth, perhaps the result of how the thread of the cloth was bleached and having nothing to do with the passing of time, is certainly the single biggest deformity that exists. It gets peculiar treatment in this new 3D work. The left side of the face (our right) has been partially retouched to minimize the effect. The other side of the face is shaped as though there was no banding but the banding remains. Pictured here is an estimate of the banding in the area of the face. At the bottom of the beard and the lower areas of the hair, darker areas that are not the result of banding are strikingly evident. These relatively dark areas don’t recede towards the background as expected for grayscale plotting. (You can’t see this without 3D glasses. Don’t even try.) What is the rationale for this obviously apparent artistic adjustment? Moreover, hair above the forehead pompadours frontward without grayscale tones to support it. This hair and facial hair treatment seems artistic. The entire head and shoulders seem to be completely detached from the background. You can, with 3D glasses on, move your own head ever so slightly and see detached movement. (Again, you can’t see this without 3D glasses.) Galmarini speaks of “hidden scientific information,” presumably but not explicitly the grayscale. I can’t find any data in support of this phenomenon. It seems as though an artificial outline has been introduced around the human form. There does not seem to be any such outline on the Shroud. In fact, researchers, over the years, have noted this lack of outline because it is something that an artist, had an artist created the Shroud, would have certainly included. Interestingly, the areas of the lower neck and upper shoulders, though darker than the background, don’t recede into the background and don’t show detached movement. Most amazingly, the lower part of a prominent water stain above the face is now worn in the hair like a miniature yarmulke while the upper part of the stain adorns the background. This, to my way of thinking, strongly suggests the use of false outlines. What other reason can there be other than to enhance the 3D effect? The most surprising thing is that the grayscale tones that to the untrained eye look like highlights and shadows, but that in fact become the basis for plotting three-dimensionality, remain in place in the plotted image. If you plot a three-dimensional object from the grayscale density you should have something that looks like a stone statue. Whatever highlights and shadows seem to exist in any resulting computerized virtual-reality image should only be from artificially introduced light placed at a calculated angle and distance in the virtual world. This is what the VP8 Analyzer does and what other software packages such as POV-Ray do. But in the anaglyph in question, it looks as though the original image was stretched like a thin film over the calculated shape. Original highlights, shadows and even herringbone twill patterns are there. 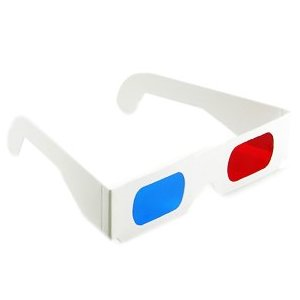 I’m willing to be convinced that I am wrong, that the anaglyph in question is scientific. I would actually like this. If this were so we would have something that is truly amazing. Clarity is needed, however. Specifics are required. I would like to see how much of this conversion to 3D is reproducible in a scientific sense and how much is "only softening the ‘holes’ and deformities." In order to claim that the 3D images on this site are scientific the steps and procedures must be reproducible by others, at least in theory. Documentation is needed. We should know the software or algorithm used to plot the image including any variables or settings used. The terminology “hidden scientific information” should be clarified. It is essential to understand how plotting software uses this data. Expose higher resolution images for examination if the work was done in higher resolution. While this image may be 800 pixels wide, the resolution is no better than 72 ppi. Ordinary books carry pictures at four times the number of pixels per inch. We should be able to see, in anaglyph form for comparison, the unadjusted, scientifically plotted part of the project so that we can judge for ourselves just how much of the final product is by way of adjustment. All adjustments made should be explained and justified. It bothers me to think that these images will be used, as the pastor suggests, in presentations to show the 3D characteristics of the Shroud. These images are certainly being displayed in churches, in exhibits and on the internet without the qualification that this is art and not science. If that is so, it is most unfortunate. On the other hand, if these images are truly scientific, then the unexplained screams out to be explained. Don’t get me wrong. There is 3D data in the Shroud’s images. It is the most important quality for knowing that these are not images formed by reflected light as a painter would envision or a camera would capture a human form. The 3D data is a quality that must be accounted for in any hypothesis attempting to explain how the images were formed, be it miraculously, naturally, by fakery or even as honest art. Indeed, this quality, treated scientifically without various forms of electronic manipulation, sooner or later, may suggest how the images were formed. In my opinion, it is time to move on. The VP8 moment was a truly historic moment, like when Wilhelm Conrad Roentgen placed his hand between a cathode ray tube and a screen covered with barium-platinum cyanide and saw the bones of his fingers. We don’t do X-rays that way any more. 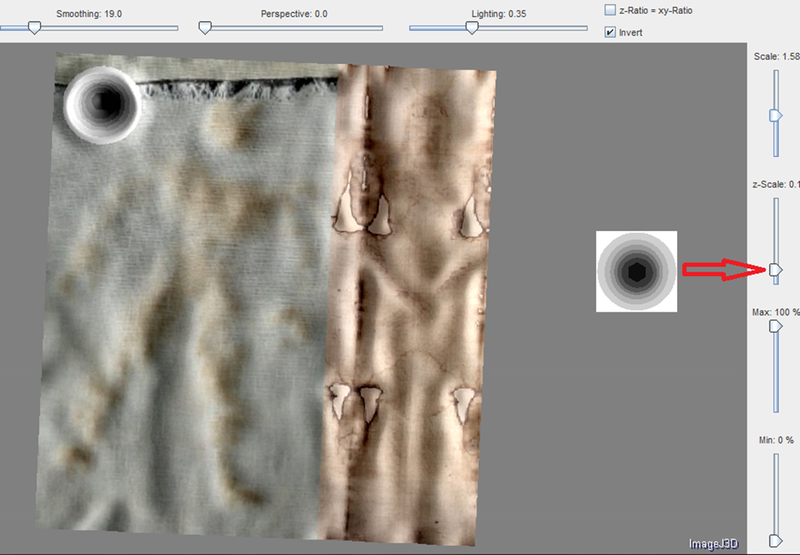 There is a lot of 3D investigation work that can be done with modern tools, such as ImageJ, and many excellent images of the shroud. The question has never been answered. Did the glass slipper fit Cinderella’s foot because it was the right size or because Cinderella’s fairy godmother had magical powers? 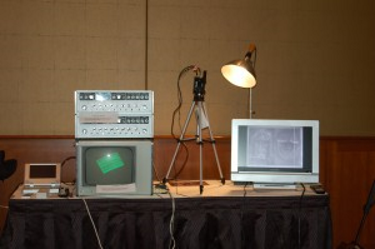 I have some questions about the VP-8 Image Analyzer. What are all those dials on the front of the unit? Is there an operating manual? What settings were used in creating the 3-D image of the shroud? How was the image data manipulated within the VP-8 or its camera including electronic low or high pass filters, Gaussian filters, softening lens filters, an out-of-focus lens, etc.? Are there any control images such as calibrated gray-scales, cross-hair fine lines, dot patterns, intended to show lighting, camera angle and lens focus? It is essential that control images be made with exactly the same VP-8 settings, lighting, camera angle and distance, focus and lens aperture. Was the surface of the Shroud picture gloss or matte? Was the lighting adjusted to avoid hotspots, etc.? Here again control images are important. Has the VP-8 been used with other Shroud photographs since 1976? If so, can we see these along with documentation? The problem with the Cinderella story is not that the slipper question was not answered. It was never asked. For additional information, here is an excellent presentation, VP8 Image Analyzer & Shroud of Turin, in PDF format at the SEAM site. I also refer you to an unnamed page at shroud.com written by Barrie Schwortz. It has some information. It refers to a gain control but doesn’t mention any other controls. On May 1, 1997, I was fortunate to spend some time in North Carolina with my friend Kevin Moran, retired Senior Technology Specialist from Eastman Kodak’s Estek Products Division and a Shroud researcher since 1978. Kevin owns one of the two functioning original VP-8 units and was kind enough to welcome me into his home and spend the next 14 straight hours working with me to videotape "new" VP-8 images. Actually, the real thanks should go to his dear wife Anne, who put up with the two of us working until 4:00am! I’d love to see the video tape. This is also a Questions and Answers paper by Deacon Pete Schumacher, a VP- Engineer. Perhaps he can answer the reader’s questions. However, in my opinion, it is time to move on. The VP8 moment was a truly historic moment, like when Wilhelm Conrad Roentgen placed his hand between a cathode ray tube and a screen covered with barium-platinum cyanide and saw the bones of his fingers. We don’t do X-rays that way any more. 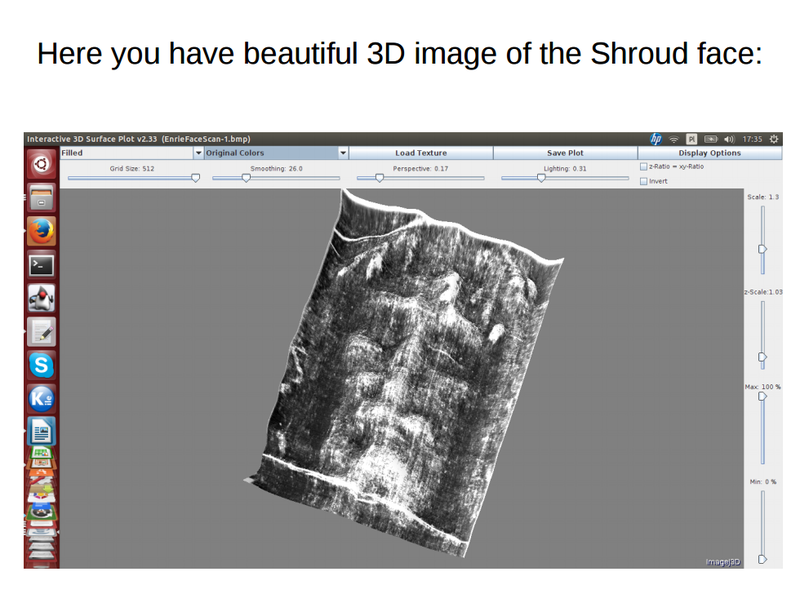 There is a lot of 3D investigation work that can be done with modern tools, such as ImageJ, and many excellent images of the shroud. What Do We Really Know About Volckringer Patterns? I suspect what appears to be 3D-ish elevation is a representation of relative chemical reaction completely unassociated with spatial relationships. Do we in fact know anything about the Volkringer patterns, except that they exist? Research into them seems vanishingly scarce, and there are only three purported examples on the internet, of which only one actually shows the plant and its effect. It’s a fern, which makes me think the pattern could be a spore print. One of the others is too badly reproduced to be sure whether it’s actually a print or the plant itself, and the other is the sort of image that might come from a VP-8, but without any context or explanation. 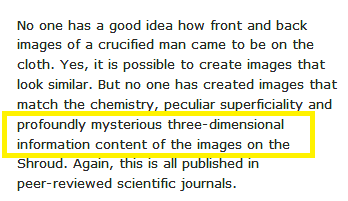 John de Salvo’s paper on shroud.com (“The Image Formation Process of the Shroud of Turin and Its Similarities to Volckringer Patterns”) references a paper by Volckringer himself from 1942, but omits part of the title. He calls it: “Le probleme des empreintes devant la science,” but in fact it is called: “Le Saint-Suaire de Turin: Le problème des empreintes devant la science”, and is clearly more to do with the Shroud than it is to do with these patterns. Can anybody help? I wonder if what we think are 3D reliefs prepared from Volckringer patterns are not something altogether different. I suspect what appears to be 3D-ish elevation is a representation of relative chemical reaction completely unassociated with spatial relationships. The veins appear higher than the blade and higher still nearer to the center rib. That would seem to be where the most lactic acid would be transferred to the paper by contact and lakes of vapor. The leaf seems really fat with an unnaturally beveled edge. That apparent bevel may result from less lactic acid reaching the paper at the edge of the leaf. To fully assess this we need to see the facing pages from the book that held the leaf. Ideally, we need to see the leaf. We need to know which side of the leaf is being plotted for 3D content. I imagine the facing page’s imprint might have a similar appearance of elevated veins and a fat bevel. That would not make sense. The point is that because something appears to have 3D characteristics, it may not be a real spatial representation. I’m not saying the Shroud’s image isn’t spatial data, what you call a height-field. I’m saying, however, that we must consider other possibilities. The DeSalvo paper Hugh mentions can be found HERE (shroud.com) and HERE (Penn State). I decided to explore this similarity in more detail. I was hoping that by understanding how Volckringer Patterns are produced, it would give me some idea of how the Shroud body image was produced. 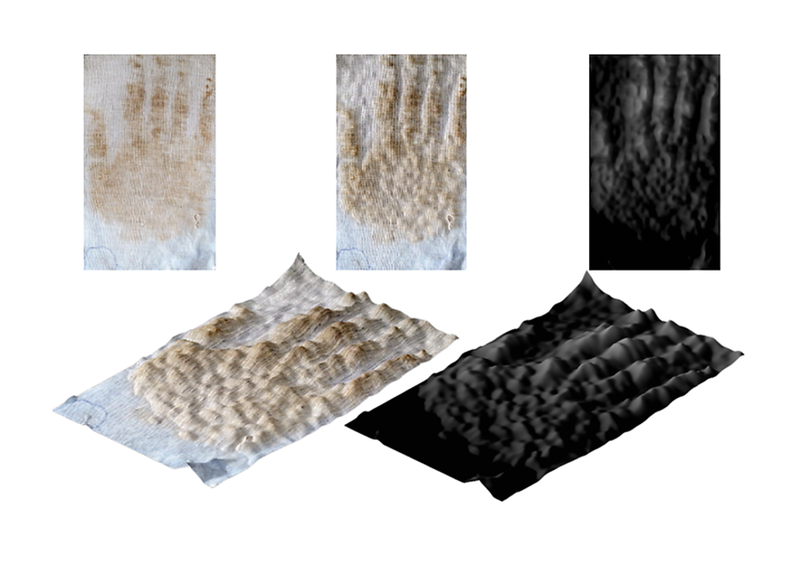 Using a spectrophotometer I did a color comparison between the Volckringer patterns and the Shroud body image. Within experimental error, I showed that the Volckringer patterns were identical in color to the Shroud body image. I than compared the Shroud and Volckringer patterns using UV Fluorescent studies. It was shown that both the Volckringer patterns and the Shroud body image do not fluoresce under UV light. 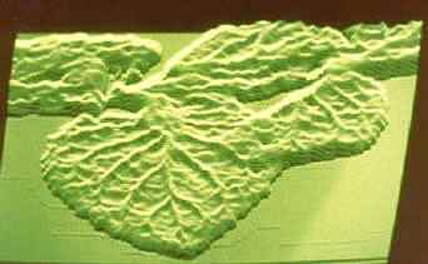 Thus the Volckringer patterns and Shroud body image also have identical UV fluorescent characteristics. 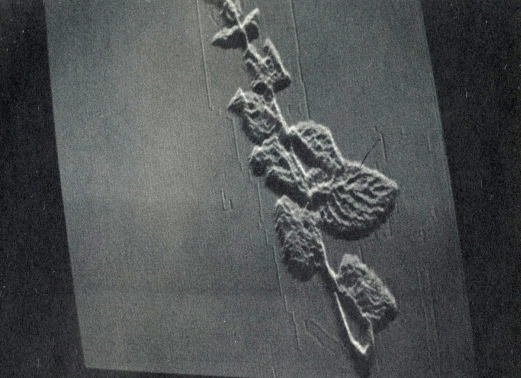 The most startling similarity was that the Volckringer patterns could be reconstructed in 3D relief using a VP-8 analyzer, just like the Shroud body image. Colin Berry’s Latest and Greatest. Is it Enough? “It’s a distillation of some 40 months and more of virtually non-stop effort since Dec 2011 to ‘model’ the ‘enigmatic’ TS body image,” he tells us. It would have been nice to use a real human subject instead of the plastic toy The technique lends itself to scaling up, and leaves the volunteer (?) unharmed, except for a coating of vegetable oil and plain white flour (most of that being imprinted onto linen, leaving less to be showered off). Alas. I do not have a 4m x 1m length of linen, and even if I did, one suspects the sourpuss contingent of sindonology would waste no time in telling me it had to be herringbone weave, centuries or millennia old, traditionally-bleached, lacking modern-day optical brighteners etc etc etc ad infinitum, ad nauseam. Nope. This science bod is content to model the TS characteristics, showing that no fancy gee whizz 20th/21st century technology is needed, certainly not pulses of intense uv rays from excimer lasers or neutrons from rock-crushing tectonic activity etc. (the sort of things that could theoretically have affected a particular linen shrouds in a 1st century rock tomb we are solemnly assured). Let’s stick with the small scale model, and show how, step-by-step, the above image was created that, from where I’m standing, ticks an ever-growing number of boxes that says: YES – it is looking increasingly like a valid model, despite it using homely medieval technology that today’s blog-readers can confirm for themselves in less than an hour in their own homes if so inclined. It requires nothing more than: (a) linen (I get mine from the clothes rack in charity shops, ladies’ white summer trousers especially) (b) plain white flour (c) vegetable oil (d) a hot oven (e) a bar of soap. Yes – indcredibly, insultingly some might say, that’s my DIY list for what’s needed. Nothing insulting about any of that. It is actually intriguing in a “Bill Nye the Science Guy” sort of way. The rest of this posting will be in two instalments: first, the procedure for obtaining the above result, namely a faint, fuzzy, negative TS-like image and then, later, possibly tomorrow, the evidence from studies reported already on my other site that the image you see above meets many , possibly most, of the criteria of the TS image at both macroscopic and microscopic level. Lots of good pictures help us understand. Yes. One can enter 2D diagrams with no 3D history, like those concentric circles above, and they show a comparable 3D response (top left) to that of the model image OR the TS. Why is that? Look at the z scale next to the red arrow. It is on its default MINIMUM setting of 0.1. The software sets that non-zero default setting, meaning that ANY image one enters that has any kind of intensity gradient, simple stepped ones included, produce a 3D response.The latter is entirely artefactual unless one has evidence to the contrary. This investigator knows of no evidence to suggest that the so-called "3D properties" of the TS image are any different from those of contact imprints generally. 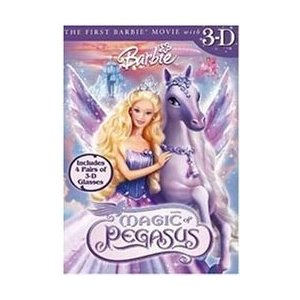 Late insertion: I’m saying there is no 3D mystique until proven otherwise. Right on cue we hear the rejoinder: "There is 3D mystique until YOU prove otherwise", adding technical details like RGB balance that were addressed previously in discussion with "OK" in Poland,. Nope. i’m not buying into that pro-authencity attempt to shift the burden of proof. I repeat: there is NO 3D mystique until proven otherwise. The so-called "unique 3D encoding" of the TS image is pure agenda-driven moonshine. See also this later comment from the inestimable Hugh Farey, with new 3D rendered images of this blogger’s hand both in original colour AND grayscale. Both show 3D enhancement (needless to say). Thank you Hugh. 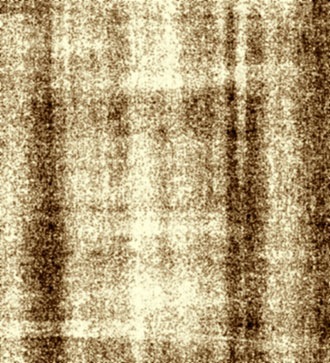 In the shroud image we are looking at a brightness-map that seems, when smoothed, to represents elevation. It happens to also look like a picture. Put the other way around, that is still true; it is a picture that, when smoothed, functions as a brightness-map (height-map, bump-map, etc.). I’ve said, clearly, that I don’t think we can say with any certainty that the brightness information, the 3D information, means body-to-cloth distance. I’ve said that there are other methods of deriving that sort of information and that the information might be real or imaginary. Regular photographs and paintings, by-the-way, can contain that information. It is wrong to say they can’t. Most don’t, though. Colin has created an image that is also a brightness-map. You can plot 3D images with it using ImageJ. The real question is this: Does the brightness-map correctly represent the shape of the body (the plastic soldier)? I’m not convinced it does. Or it is too crude. We need some better pictures to work with. We need to do more in ImageJ. We need to be sure that ImageJ is being used correctly. 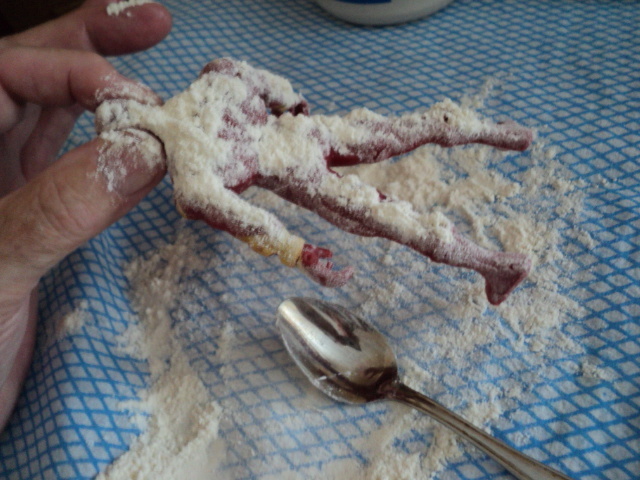 By-the-way, I have been impressed with the 3D imaging of Colin’s hand. So maybe Colin is onto something. In his blog, however, he is trying to make an issue out of nothing by playing with the word mystique. (Click on the image of the hand to see this image enlarged). to better understand what we are really looking at. After a careful reading of Professor John Jackson’s paper «The vertical alignment of the frontal image» and also remembering the 2005 Professor Latendresse’s paper «The Turin Shroud was not flattened before the images formed and no major image distortions necessarily occur from a real body» I was aware that if the Shroud wrapped a real human body that impressed his image on the cloth some distortions were inevitable and 3D scanning by VP-8 device produced a kind of bas-relief of a human shape with enough anatomical accuracy. 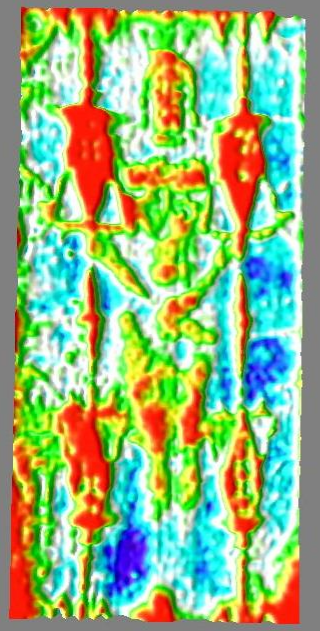 As far as I know VP-8 scanning of the Shroud Image was done using Shroud real size photos OF A FLATTENED SHROUD and considering just the front image Professor Jackson acknowledges that even admitting a vertical path of information transfer from body to cloth the image will have some distortions. Get a real size replica of the Shroud with the image photograph on a linen cloth, then place the front image over a volunteer with anatomical characteristics similar to the Man of the Shroud (image upside, non image part of the cloth covering the volunteer). Placing the cloth like this not too tight would allow overlap the front image following main anatomical body curves namely head, and limbs. Considering these conditions if an image 3D scanning with VP-8 or with a more modern device is done- I don’t really know if it is technically feasible to scan the image in this scenario) would there be the possibility for much lower distortion and obtaining not a human shape bas relief but A KIND OF HUMAN BODY VOLUMETRIC IMAGE(without side parts that did not produce image on the cloth) ???? Perhaps this is a silly hypothesis…. Not at all. We need to do a lot more with the 3D questions that the shroud poses to better understand what we are really looking at. And this idea of yours for minimizing distortion makes a lot of sense. The VP-8, to the best of my knowledge, in this context only interprets brightness information that already represents spatial data. If I understand you correctly, you want to capture new and additional spatial information to combine with the spatial information in the shroud image. Here are two videos that are worth watching. 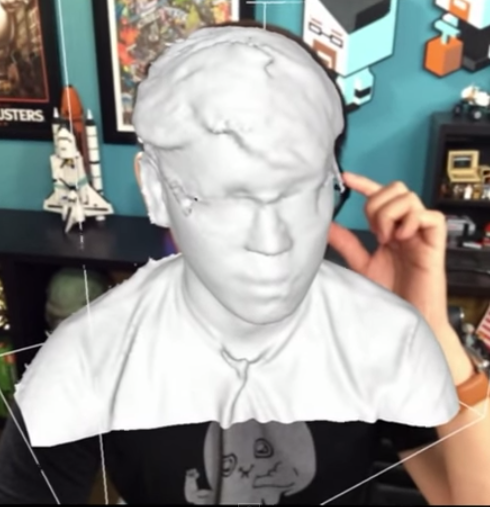 This is blow- your-mind 3D technology. A couple of watching tips: The first video begins advertising clothing at the four minute mark. I’m not actually suggesting that you hit the stop button there. But I do. The second video gets very interesting at around 5 minutes so hang in there.